Adopting a healthy lifestyle is one of the best ways for seniors to prevent illnesses and injuries that could shorten their lives. Giving up smoking, eating more vegetables, and exercising more are all things your aging loved one can do now to make up for former bad habits. You can use these tips to help your loved one get motivated for making better lifestyle choices. Starting a major health change can be overwhelming for seniors. For instance, your loved one may not be able to imagine giving up smoking after twenty years or skipping his or her nightly dessert. Make it easier for your loved one to see him or herself actively changing by suggesting a smaller step, such as skipping the after-lunch smoke or trying a fruit dish one night a week instead of dessert. Not all seniors are comfortable with the idea of making small changes. Their self-confidence might be affected if they’re unable to walk or move around without assistance. Living with a serious health condition can make it challenging for seniors to age in place. However, they can maintain a higher quality of life with the help of professional live-in care. Oshkosh seniors can benefit from assistance with meal prep, bathing, transportation to the doctor’s office, medication reminders, and much more. Many people have difficulty seeing how far they’ve come, which poses a challenge when they encounter a setback. Encourage your parent to mark down each one of his or her successes on a calendar. Seeing that he or she managed to exercise most of the days in a week may help your loved one stay on track, even if he or she makes a mistake. Incentives activate the reward center in the brain that makes a person want to continue to establish a habit. These incentives can be anything from a new pair of walking shoes to a special trip to a favorite place. If your loved one responds to rewards, keep them simple. Alternatively, your loved one could work up to a major reward over time, such as a vacation. Taking part in social events is an excellent way to encourage seniors to make healthy lifestyle changes. You can accompany your loved one to fun carnivals and even technical workshops that help him or her polish a variety of skills. If your commitments don’t allow you to take part in activities with your loved one, a professional caregiver is in the best position to do the job. Oshkosh elder home care experts are available to provide high-quality care to seniors on an as-needed basis. 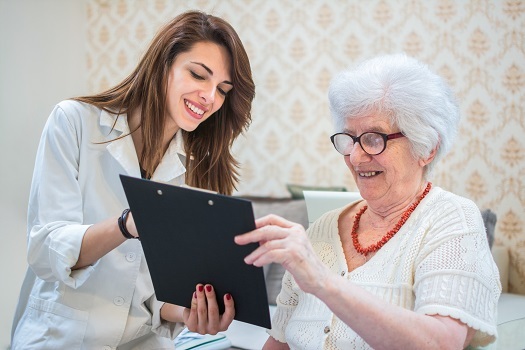 From assistance with mobility and exercise to providing transportation to the doctor’s office and social events, there are a variety of ways professional caregivers can help your aging loved one continue to live independently. Your loved one may brush off your concerns but listen to his or her doctor. If possible, talk to your loved one’s doctor before the appointment about issues you’d like addressed. The physician may also have ideas for helping your loved one adopt healthy lifestyle practices. A team mentality may help when motivation gets low because your loved one might feel accountable for making sure you both stay on track with your goals. For instance, your loved one will be ready to get dressed and go for a walk if you start lacing up your shoes first. This strategy is also a great way to overcome anxiety your loved one might feel about joining a gym or workout class. A healthy lifestyle doesn’t have to be boring. Try taking your loved one to a new place to walk, or sign him or her up for a senior dance class to add a touch of cardio to the day. You can also experiment with new healthy recipes together in the kitchen and learn strategies for healthy living from your loved one’s professional caregiver. Turning healthy living into a fun and natural part of your day helps you both make better choices together. Aging adults who require assistance with the tasks of daily living can benefit from reliable in-home care. Oshkosh, WI, families trust Home Care Assistance to provide the high-quality care their elderly loved ones need and deserve. Our caregivers are trained to help seniors prevent and manage serious illnesses and encourage them to make healthier decisions as they age. If you have any questions about our premier in-home care, call us at (920) 710-2273.